I never did learn how Julie managed to be at Ray and Christy's yesterday. She didn't drive herself, because she accepted a ride home with me. It was on the way home that she asked, "Mr. Firehammer, couldn't we make our visit with the LaPages for lunch?" "That would be alright with me, Julie. I know how much you worked today and just didn't want to burden you with lunch tomorrow," I said. "Oh Mr. Firehammer, it would be no burden at all. I'll call them if you like," she volunteered. "That would be fine," I said, being pretty sure she only wanted an excuse to talk to Christy. And that's why Ray and Christy showed up at about eleven the next day. Julie was busy in the kitchen so I went to the door myself when they arrived. Christy immediately greeted me with a warm hug and kiss. Then with great exaggeration, "Oh, Regi, you don't know how I've missed you." "Oh get in here, you brat," I said. "I know the one you really missed is Julie. She's in the kitchen. Ray and I will be on the patio having a smoke." "Don't think you're getting out of our little discussion about consciousness," Christy said. Lunch was what Julie calls a "pick-up" lunch—lots of things to pick at; breads, cold meats and spreads, various condiments and cold drinks. Everyone was more interested in talking than lunch it seemed and the discussion began while we were eating. "So what exactly is consciousness, Regi?" Christy began. "I can tell you what consciousness is, but the real question is what is its nature. So let's first identify what we mean by consciousness. I'll tell you how I identify it, but I'd like to know what you think it is. You use the term, what do you mean when you say conscious or consciousness? It doesn't have to be you Christy, I'm be interested in anyone's view of what consciousness is." "Well one thing it is, is the difference between being asleep (unconscious) and awake (conscious)," Ray said. "That's true," I said, "but what is it about being awake that is different from being asleep? What does being awake or conscious mean; how is it different from being asleep?" I asked. "When we are asleep we do not see or hear anything," Julie said. "...or feel, smell, or taste anything either," Christy added. "I don't mean to be picky, but we might do any of those things when we're dreaming," I said, "but I'd like to put dreams aside for now. Otherwise I think Julie and Christy have identified exactly what being conscious means. It means our awareness of all that we can be directly aware of by seeing, hearing, smelling, tasting, and feeling it. The technical name for that direct awareness is perception. But there is one other aspect of awareness that is usually neglected called, 'interoception,' which is our direct awareness of the internal actions and states of our bodies. "I want to make one other point which is not necessary, but may be important later. What we directly perceive is physical existence, and it is all that we can be directly conscious of. "I think Julie, Christy, and I all agree that consciousness is direct perception of all that we can be aware of by means of seeing, hearing, smelling, tasting, feeling, and interoception. But you haven't said anything, Ray. Do you have a question about that?" "I do," Ray said. "I agree that it is obvious consciousness is our perception of everything physical, but I'm conscious of many things that I do not think are physical. I'm conscious of every idea I have, and everything I think, for example. I do not see how those are physical things. My thoughts would not even exist if I did not think them. How is that consciousness perception of the physical?" "That's right. But I don't want to leave your question up in the air, so to speak, so I'll give you a short, incomplete answer, that I hope will at least satisfy our immediate interest in consciousness, without having to address the whole of epistemology. Does anyone have an objection to that?" "Well that's really hard to say until we've heard your answer," Ray said. "Oh Ray," Christy said. "You're being a bit contrary, aren't you." "No, Darling," he's not being contrary," I said. "He's being exactly what he should be. We should never just accept anything until we understand it. "So what," I continued, "are we conscious of when we are conscious of ideas, or thoughts, or reason? What one thing must we used to have an idea, or a thought, or to reason?" Everyone thought for a moment, and I was not at all surprised that Christy knew right away. "Words. Language," she said. "All our ideas are held in the form of words or sentences; we think by using language like silently talking to ourselves, and we reason by means of language." Only Julie seemed surprised by Christy's obvious answer, but Ray was never surprised by her brilliance. "Oh, that's right," Julie said, openly admiring her. "That's right," I said, "and all our ideas, and thinking, and reasoning must use words, and words are some kind of perceivable symbols by which ideas or concepts are identified, either written (which we can see) or spoken (which we can hear) or even signed (which can be seen), and since they can be seen or heard they are physical, and it is words that make it possible for us to be directly conscious of our ideas, thoughts and reasoning. "I know that is a very brief and incomplete explanation and I'll not be disappointed if it does not satisfy your question, Ray," I said. "Oh, but it does," he assured me. "The funny thing is, almost as soon as I said, 'epistemology,' I knew the answer. I just needed to be reminded, Regi." Julie said she would like to take a break, but actually wanted to clean up and bring us all coffee, which we decided to do. Christy went to help Julie and Ray and I had a smoke, and the girls soon arrived with a tray cookies and coffee. Julie also had a small envelope in her hand which she laid on the table beside her. "Regi, you promised to explain what consciousness actually is," Julie said as soon as everyone was settled. "I promised to explain what the nature of consciousness is. We already know what consciousness is, that is, what we mean when we use the word. It is the nature of consciousness that is almost never specifically identified and why so much nonsense is associated with it and why so many think it can have a physical explanation. "The nature of anything is whatever its attributes are. The primary or main attributes of consciousness are continuity, unity, unperceivability, non-physicality, and unpredictability. I nodded to Julie and she removed four cards from her envelope and handed one to each of us. "If no one objects, I'd like to discuss each of these attributes of consciousness in order," I began. No one seemed to object so I began with continuity. "What I mean by continuity is, for any conscious organism, it's consciousness is the same consciousness from moment to moment, day to day, and year to year, from the moment it begins to be conscious until the day the organism dies. Hypothetically, all of the physical aspects of an organism could be changed, but it would still be the same organism, because it would still be the same consciousness." I paused to see if I were perhaps going too fast, but everyone was just staring at me waiting for me to continue. "An organism's consciousness does not cease when it sleeps, or otherwise is unconscious; in those cases, consciousness is like the life of a seed. A seed is a living thing, although it does not exhibit any of the usual characteristics of life externally; we say it is "dormant" because under proper conditions it will germinate and grow. Consciousness, during sleep, is like the life of a seed, dormant, because when the the hypothalamus is stimulated, consciousness revives. If consciousness truly ceases, however, nothing can revive it, and the organism that is that consciousness ceases to exist." I paused to see if anyone had any questions. Ray did. "What about the case of amnesia, Regi. If someone cannot remember anything of their past, is that consciousness still the same one?" Christy perked up at the question, apparently thinking it was worth asking too. "That's a good question, Ray. Of course it only pertains to human beings, as far as we can know, but what do you think? Does having amnesia mean one suddenly has a new or different consciousness?" Julie looked thoughtful, and then surprised me. "Just saying, 'if I lost my memory,' means, 'I,' lost my memory which would have to be the same 'I' that had not lost it yesterday. When I say, 'I,' I mean myself, my consciousness, because that is the me that is always me." She paused. "I'm not sure I'm saying it right, but I know amnesia wouldn't change my consciousness, only what it could remember. It would still be me, the same consciousness," she concluded. "I think you are right," Ray concluded. "And you said it right too," he added. "Julie's right, of course. I like what she said about 'I' being my consciousness, because it's the only thing about us that is always the same thing." Though I did not expect it, everyone seemed to agree, so I went on to unity. "By unity I mean, for any conscious organism, there is only one consciousness and it is the same consciousness that perceives what is seen, what is tasted, what is heard, smelled, and felt, and all one experiences internally as well as (in human beings) being conscious of all that one is thinking, imagining, feeling, and choosing and it is aware of all these things simultaneously and continuously. "For example, if one is driving, it is the same consciousness that feels the wheel of the car with the hands, the accelerator pedal with the foot, sees the light change from red to green, and hears the music on the radio while consciously conversing with one's passenger all simultaneously. This aspect of consciousness is almost never recognized. It is one reason, for example, no computer or computer program would ever be able to create consciousness. It would be impossible, at the physical level, to make all the discrete physical events required for detection of those separate things be a single event or phenomenon." "You're right, Regi," Ray said, rather enthusiastically. "I never ever thought about the fact I am conscious of so many different things at the same time, not only conscious of them but aware that they are separate and different things, and yet it is my one and only consciousness that is aware of them all." "It really seems obvious once you notice it, doesn't it," Christy said, and they all agreed it was obvious. "Why do we not notice it, then?" Christy asked. "To a large extent it's because we take consciousness for granted, because we are conscious and do not need to pay attention to it to be conscious. It's like looking at the world through a window. While it is the window that makes at possible for us to look at the external world, we don't think about the window while observing the clouds, the trees, the flowers, and the birds we are seeing." There seemed to be no other questions so I continued. "I think the next aspect of consciousness on your cards is that consciousness cannot be perceived. 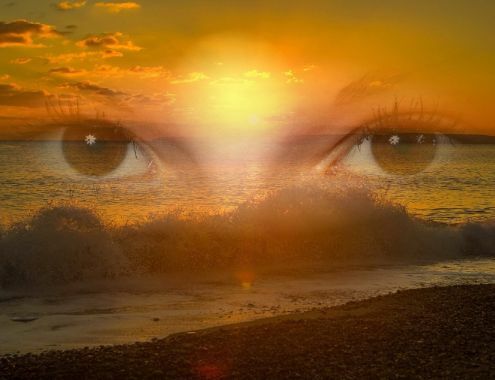 What that means is that consciousness consists of all that can be perceived and is being perceived at any moment. Since what is perceived is physical existence, if there is anything that exists that cannot be perceived, it cannot be physical. "We are directly conscious of the physical, but we are not and cannot be conscious of consciousness itself. This is obviously true of other's consciousness. No one can ever be conscious of what anyone else consciously experiences. It is also true of our own consciousness, which takes a little thinking to understand. We know we are conscious because we are, but it is not by being conscious of our consciousness. Just as we know we can see because we do see, we nevertheless cannot see our seeing. We know we can see, not by seeing it, but by the fact we see. We know we are conscious not be being conscious of it, but by the fact that we are conscious. "Therefore we know our consciousness exists, but cannot perceive our consciousness, because our consciousness is not physical, else we would be able to perceive it. In short, consciousness of physical existence and consciousness itself cannot be the same thing or have the same attributes." Ray had discussed this with me before, but still did not seem to be comfortable with it. Julie looked as though it was all obvious to her, and perhaps it was. Only Christy seemed to suddenly grasp it as an epiphany. "Yes of course," she exclaimed. "I can see this beautiful table and taste all the delicious things Julie prepared, and am aware of all that is happening around me but I do not perceive my seeing, or tasting, or consciousness, I just see, taste and am aware. My conscious is not something I perceive, it is my conscious perceiving, and I know it because I am conscious, but I'm not conscious of it, I do not perceive, my consciousness." "Mr. Firehammer," Julie interrupted, "are people actually confused about this. Isn't it obvious to everyone that what they are conscious of and their consciousness of it are not the same thing?" Julie appeared sincerely bewildered. I could not resist laughing. "Julie, almost everyone is confused about the difference between what they perceive and the fact they perceive it. And worse today, they are certain that all there is to perceive is physical reality and believe their perception of it is physical as well." Julie did not say anything, but it was obvious she found it incredible. "It's true," Ray assured her. "I thought so for a long time, especially under the influence of my college professors who were all 'physicalists,' who believe the physical is all there is." Julie just shrugged in resignation to that disappointing revelation, so I moved on to the next point. "I think we actually addressed the next point about there being no physical description of consciousness when we talked about the taste of cinnamon." "Yes, I remember," Christy said. "Every physical aspect of tasting cinnamon can be described from the simulation of the olfactory nerves by ... by that chemical ...."
"Yes, that's it," Christy continued, "and all the physical behavior of the neural system and behavior of the brain associated with tasting cinnamon can be identified, but none of it or any other physical description is a description of the conscious experience of tasting cinnamon," she concluded. "Well, everyone was there, and Christy has captured the essence of it, I think. Are there any questions?" There were none, so I proceeded to the last point printed on their cards. "The final point is that consciousness is only possible to living organisms. Life, like consciousness is an attribute. It is the attribute that distinguishes mere physical existents from those existents we call living organisms. It is also the attribute that makes consciousness possible, and like consciousness, is not a physical attribute. I think I also mentioned that when we were discussing the taste of cinnamon." "Also, like consciousness, life has a specific nature, and while we can identify life as the attribute that distinguishes between non-living physical entities and those unique physical entities called organisms, that identification does not describe the actual nature of life itself. That description is very important because it is life that makes consciousness possible and more importantly the nature of the human mind possible." "Well?" Christy said, when I paused. "Well, what Darling?" I asked as innocently as possible. "Well are we going to discuss the nature of life?" she asked a little impatiently. "Of course," I said, "but not today." "Oh," was all Christy said, obviously disappointed. "When is your next day off?" I asked. "Friday," Christy said. "But Ray has to work." "If you want to do something Friday, Regi, I can take the day off," Ray said. "Why don't we make it Saturday, then," I suggested. Christy looked at Ray. He appeared to nod. "No, let's make it Friday," Christy said. "That would be perfect. I'll call Julie, I want to bring something, or at least help," Christy said. So we were set to continue the conversation on the nature of life on Friday.